The Saarland (German: das Saarland, [das ˈzaːɐ̯lant]; French: la Sarre [la saʁ]) is one of the sixteen states (or Bundesländer) of the Federal Republic of Germany. With its capital at Saarbrücken, it has an area of 2,570 km² and its population (as of 30 April 2012) is approximately 1,012,000. In terms of both area and population size – apart from the city-states of Berlin, Bremen and Hamburg – it is Germany's smallest state. The wealth of its coal deposits and their large-scale industrial exploitation, coupled with its location on the border between France and Germany, have given the Saarland a unique history in modern times. From 1947 to 1956 the Saarland was a French-occupied territory (the "Saar Protectorate") separate from the rest of Germany. Between 1950 and 1956, Saarland was a member of the Council of Europe. In 1955, in another referendum, the inhabitants were offered independence, but voted instead for the territory to become a state of West Germany. From 1920 to 1935, and again from 1947 to 1959, the inhabitants of the Saarland used money (Saar franc) and postage stamps issued specially for the territory. Saarland is the result of a regulation of the treaty of Versailles and was created in 1919. Prior to this creation, there never existed a comparable administrative unit or a feeling of togetherness. The region of the Saarland was settled by the Celtic tribes of Treveri and Mediomatrici. The most impressive relic of their time is the remains of a fortress of refuge at Otzenhausen in the north of the Saarland. In the 1st century BC, the Roman Empire made the region part of its province of Belgica. The Celtic population mixed with the Roman immigrants. The region gained wealth, which can still be seen in the remains of Roman villas and villages. Roman rule ended in the 5th century, when the Franks conquered the territory. For the next 1,300 years the region shared the history of the Kingdom of the Franks, the Carolingian Empire and of the Holy Roman Empire. The region of the Saarland was divided into several small territories, some of which were ruled by sovereigns of adjoining regions. Most important of the local rulers were the counts of Nassau-Saarbrücken. Within the Holy Roman Empire these territories gained a wide range of independence, threatened, however, by the French kings, who sought, from the 17th century onwards, to incorporate all the territories on the western side of the river Rhine and repeatedly invaded the area in 1635, in 1676, in 1679 and in 1734, extending their realm to the Saar River and establishing the city and stronghold of Saarlouis in 1680. It was not the king of France but the armies of the French Revolution who terminated the independence of the states in the region of the Saarland. After 1792 they conquered the region and made it part of the French Republic. While a strip in the west belonged to the Département Moselle, the centre in 1798 became part of the Département de Sarre, and the east became part of the Département du Mont-Tonnerre. After the defeat of Napoleon in 1815, the region was divided again. Most of it became part of the Prussian Rhine Province. Another part in the east, corresponding to the present Saarpfalz district, was allocated to the Kingdom of Bavaria. A small part in the northeast was ruled by the Duke of Oldenburg. On 31 July 1870, the French Emperor Napoleon III ordered an invasion across the River Saar to seize Saarbrücken. The first shots of the Franco-Prussian War 1870/71 were fired on the heights of Spichern, south of Saarbrücken. The Saar region became part of the German Empire which came into existence on 18 January 1871, during the course of this war. In 1920 the Saargebiet was occupied by Britain and France under the provisions of the Treaty of Versailles. The occupied area included portions of the Prussian Rhine Province and the Bavarian Rhenish Palatinate. In practice the region was administered by France. In 1920 this was formalized by a 15-year League of Nations mandate. In 1933, a considerable number of communists and other political opponents of National Socialism fled to the Saar, as it was the only part of Germany that remained outside national administration following the First World War. As a result, anti-Nazi groups agitated for the Saarland to remain under French administration. However, with most of the population being ethnically German, such views were considered suspect or even treasonable, and therefore found little support. When the original 15-year term was over, a plebiscite was held in the territory on 13 January 1935: 90.8% of those voting favoured rejoining Germany. Following the referendum Josef Bürckel was appointed on 1 March 1935 as the German Reich's commissioner for reintegration (Reichskommissar für die Rückgliederung des Saarlandes). When the reincorporation was considered accomplished, his title was changed (after 17 June 1936) to Reichskommissar für das Saarland. In September 1939, in response to the German Invasion of Poland, French forces invaded the Saarland in a half-hearted offensive, occupying some villages and meeting little resistance, before withdrawing. A further change was made after 8 April 1940 to Reichskommissar für die Saarpfalz; finally, after 11 March 1941, he was made Reichsstatthalter in der "Westmark" (the region's new name, meaning "Western March or Border"). He died on 28 September 1944 and was succeeded by Willi Stöhr, who remained in office until the region fell to advancing American forces in March 1945. After World War II, the Saarland came under French occupation and administration again, as the Saar Protectorate. Under the Monnet Plan France attempted to gain economic control of the German industrial areas with large coal and mineral deposits that were not in Soviet hands: the Ruhr and the Saar area. Attempts to gain control of or permanently internationalize the Ruhr area (see International Authority for the Ruhr) were abandoned in 1951 with the German agreement to pool its coal and steel resources (see European Coal and Steel Community) in return for full political control of the Ruhr. The French attempt to gain economic control over the Saar was more successful at the time, with the final vestiges of French economic influence not ending until 1981. France did not annex the Saar or expel the local German population, as opposed to fate of Upper Silesia which was annexed by Poland in 1949 in accordance with the peace treaty between Poland and the GDR/East Germany (see also Allied-occupied Germany). From 1945 to 1951, a policy of industrial disarmament was pursued in Germany by the Allies (see the industrial plans for Germany). As part of this policy, limits were placed on production levels, and industries in the Saar were dismantled just as in the Ruhr, although mostly in the period prior to its detachment (see also the 1949 letter from the UK Foreign Secretary Ernest Bevin to the French Foreign Minister Robert Schuman, urging a reconsideration of the dismantling policy). In 1948, the French government established the Saarland University under the auspices of the University of Nancy. It is the principal university in the Bundesland, the other being HTW. In 1954, France and the Federal Republic of Germany (West Germany) developed a detailed plan called the Saarstatut to establish an independent Saarland. It was signed as an agreement between the two countries on 23 October 1954 as one of the Paris Pacts, but a plebiscite held on 23 October 1955 rejected it by 67.7%. On 27 October 1956, the Saar Treaty declared that Saarland should be allowed to join the Federal Republic of Germany, which it did on 1 January 1957. This was the last significant international border change in Europe until the fall of Communism. The Saarland's reunification with the Federal Republic of Germany was sometimes referred to as the Kleine Wiedervereinigung ("little reunification", in contrast with the post-Cold War absorption of the GDR). Even after reunification, the Saar franc remained as the territory's currency until West Germany's Deutsche Mark replaced it on 7 July 1959. The Saar Treaty established that French, not English as in the rest of West Germany, should remain the first foreign language taught in Saarland schools; this provision was still largely followed after it was no longer binding. Since 1971, Saarland has been a member of SaarLorLux, a euroregion created from Saarland, Lorraine, Luxembourg, Rhineland Palatinate, and Wallonia. The state borders France (département of Moselle, which forms part of the région of Grand Est) to the south and west, Luxembourg (Grevenmacher District) to the west and Rheinland-Pfalz to the north and the east. It is named after the Saar River, a tributary of the Moselle River (itself a tributary of the Rhine), which runs through the state from the south to the northwest. One third of the land area of the Saarland is covered by forest, one of the highest percentages in Germany. 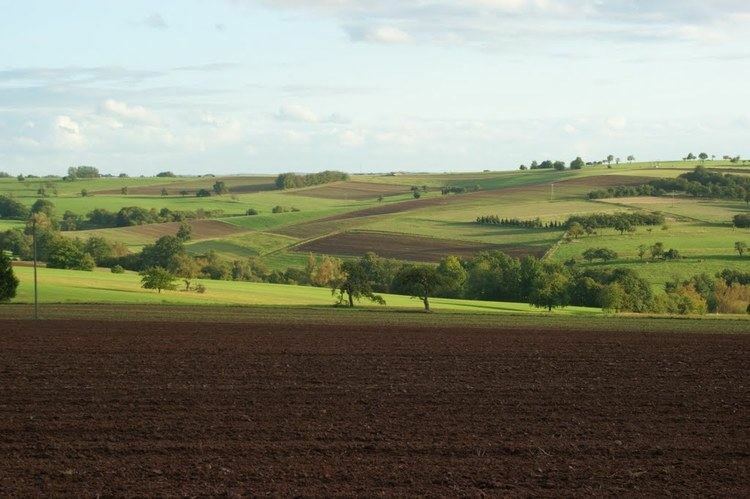 The state is generally hilly; the highest mountain is the Dollberg with a height of 695.4 m (2281 feet). 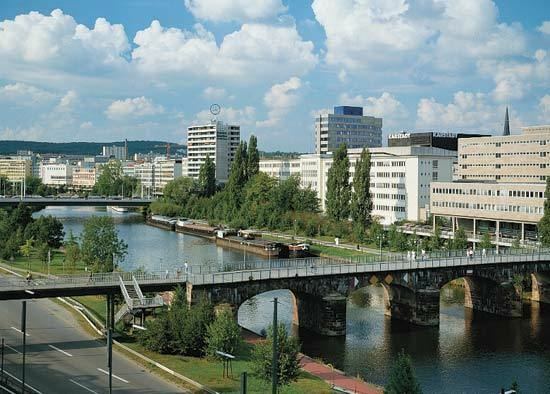 Most inhabitants live in a city agglomeration on the French border, surrounding the capital of Saarbrücken. See also List of places in Saarland. The adherents of the Catholic Church comprise 59.8% of the population, organised in the two dioceses of Trier (comprising the formerly Prussian part of Saarland) and Speyer (for the smaller eastern formerly Palatine part). 18.4% of the Saarlandic population adhere to the Evangelical Church in Germany (EKD), organised in the two Landeskirchen named Evangelical Church in the Rhineland and Evangelical Church of the Palatinate, both following the same former territorial partition. 21.8% are not affiliated with one of these churches. Saarland has the highest concentration of Roman Catholics of any German state, and is one of two states (the other being Bavaria) in which Catholics form an absolute majority (over 50%). Except for the period between 1985 and 1999 – when the centre-left Social Democratic Party of Germany (SPD) held a majority of seats in the Landtag (state diet) – the centre-right Christian Democratic Union (CDU) has governed the Saarland, either alone or in coalition, continuously since the accession of the state to the Federal of Republic of Germany in 1957. After the most recent state elections – held in 2012 following the collapse of the "Jamaica coalition" agreement of 2009 between the CDU, the liberal FDP, and the centre-left Bündnis 90/Die Grünen (The Greens) – the CDU and SPD, as the two largest parties in the Landtag, decided upon the formation of a "grand coalition" under the overall leadership of the current minister-president, Annegret Kramp-Karrenbauer (CDU). Important income sources are automobile industry, steel industry, ceramic industry and computer science and information systems industry. In the past, coal mining was an important branch of industry. Saarland is home to the Saarland University. People in the Saarland speak Rhine Franconian (in the southeast, very similar to that dialect spoken in the western part of the Palatinate) and Moselle Franconian (in the northwest, very similar to that dialect spoken along the Moselle River and the cities of Trier or even in Luxembourg). 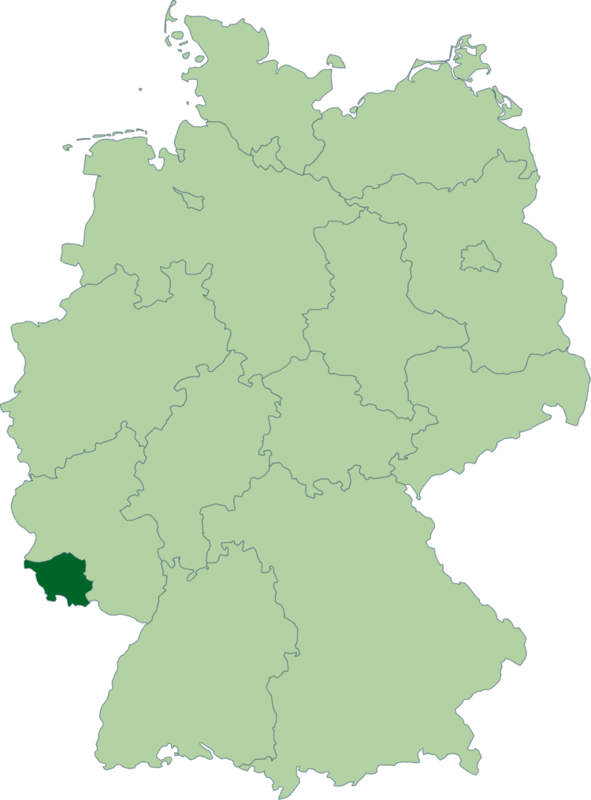 Outside of the Saarland, specifically the Rhine-Franconian variant spoken in the Landeshauptstadt Saarbrücken is generally considered to be the Saarland dialect. The two dialect regions are mainly separated by the "das/ dat" isogloss; in the northwestern portion of the state, including cities such as Saarlouis, standard German "das" is pronounced with a final [t] instead of an [s]. In general, both dialects are an integral part of the “Saarlandish” identity and thus a strong source of local patriotism. Both dialects, even more so in their respective Saarland flavour, share many characteristic features, some of which will be explained below. Women and girls are often referred to using the neuter grammatical gender, es, with the pronunciation being something like Ähs. Ähs hat mir's gesaat (it told me so, instead of she told me so; vs. High German: Sie hat es mir gesagt). This stems from the word Mädchen (girl) being neuter in German (es is correct in German when referring to words like Mädchen but would not be used by itself in reference to a woman). The genitive case does not exist at all and is entirely replaced by constructs with the dative case. In most instances, a word is not altered when cast into the dative case. Exceptions are mostly pronouns. The same holds for the accusative case. Even more so, it is accepted practice to use the nominative case instead of the accusative. Diphthongs are less common. This is because the Standard German diphthongs ei and au are each the result of a merger of two Middle High German vowels – however, these mergers did not take place in the Saarland, and only one of the two merged vowels is pronounced as a diphthong. The front rounded vowels ö, ü, and eu are replaced by e, i, and ei respectively. Both the Rhein-Franconian and Mosel-Franconian dialects (and Luxemburgish) have merged the palatal fricative "ich" sound with the post-alveolar fricative (the sound in Schule 'school') causing minimal pairs such as Kirche 'church' and Kirsche 'cherry' to be pronounced in the same way. French has had a considerable influence on the vocabulary, although the pronunciation of imported French words usually is quite different from their original. Popular examples comprise Trottwaa (from trottoir), Fissääl (from ficelle), and the imperative or greeting aalleh! (from allez!). The English phrase My house is green is pronounced almost the same (in the Rhine Franconian variant): Mei Haus is grien. The main difference lies in the pronunciation of the r sound. Regional beer brewer Karlsberg has taken advantage of the Saarlandish dialect to create clever advertising for its staple product, UrPils. Examples include a trio of men enjoying a beer, flanked by baby carriages, the slogan reading "Mutter schafft" (meaning "Mom's at work" in Saarlandish, but plays on the High German word "Mutterschaft", or "motherhood"); another depicts a trio of men at a bar, with one realizing his beer has been drunk by one of the others, the slogan reading "Kenner war's" (meaning "It was no one" [Keiner war es] in Saarlandish, but playing on the High German word "Kenner", or "connoisseur", translating to "It was a connoisseur"); a third shows an empty beer crate in the middle of outer space, the text reading "All" (meaning "empty" in Saarlandish, but playing on the same High German word meaning "outer space"). The French language has a special standing in Saarland due to the fact that France sought to incorporate the region into the French state shortly after World War II and subsequently pressed the Federal German government to promote French as a second language in schools (ahead of English or any other foreign language education in the state). Today, a large part of the population is able to speak French, and it is compulsory at many schools. Saarbrücken is also home to a bilingual "Deutsch-Französisches Gymnasium" (German-French high school). In January 2014 the Saarland state government announced its aim of making the region fully bilingual in German and French by 2043. The Saar competed in the qualifying section of the 1954 FIFA World Cup, but failed after coming second to West Germany but ahead of Norway. It also competed as Saar in the 1952 Summer Olympics and the field handball world championships in the beginning of the 1950s.